I can't believe summer is finally...and not-so-finally, here. I do love this season though, as it means new styles and new trends...in our events and in our lives. So, on the personal side of things, I wanted to share with you my Six Summer Should-haves, because every boldly chic girl (or boy!) needs to use this change in season as a reason to shop! 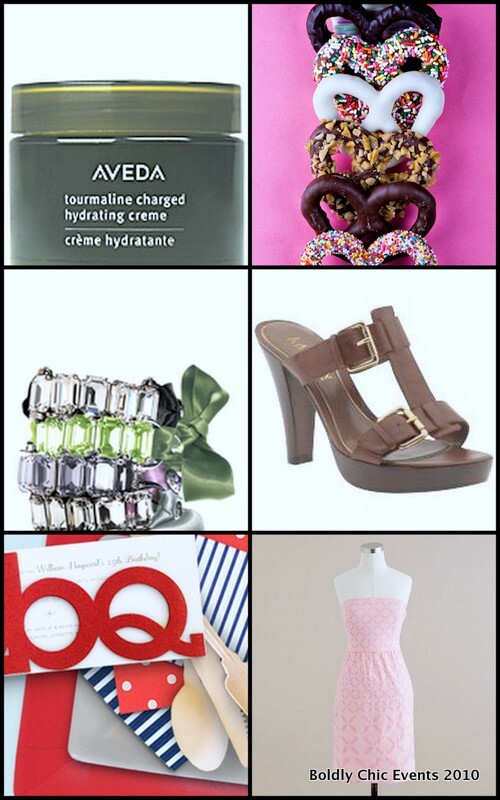 And, if you are a party planner or a party go-er...it never hurts to have some amazing items right inside your closet. 1. With warm weather, beautiful skin is everywhere you look. Take care of yours with the right products. My fav is Aveda's Tourmaline. 2. Something sweet. Other than an incredible cocktail at the pool, indulge in something yummy this summer! I love Sweet Things on the north side of Indianapolis...and always splurge on their chocolate covered pretzels. 3. Sparkle. A huge trend this summer is bold and big accessories. Henri Bendel makes these Pussycat bracelets and I am placing my order tomorrow. 4. Beautiful, chunky shoes. These Ralph Lauren's are perfect. 5. Pretty paper. I vote that you need this all year round, but there are so many reasons to entertain during the warm months that you want to make sure you have pretty paper around for invites and thank you's. Kate's Paperie makes great seasonal items. 6. The perfect summer dress. Of course, I chose this pink J.crew number...but who is surprised? Color is in this summer though, so try to find the perfect hue for you. So much happens in the summer, and if you are like me you always have somewhere to be where you have to look your best. If you are in the midst of planning a party, are a bride-to-be or if you are simply planning to attend a celebration this summer...enjoy the beautiful things and spend some time on yourself.